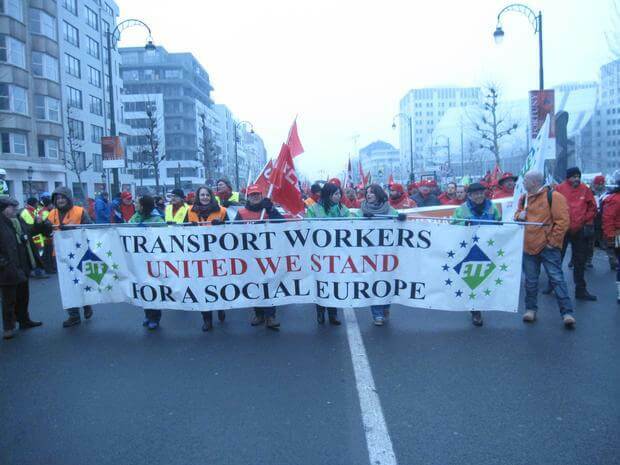 This week the European Transport Workers’ Federation (ETF) launched a set of concrete proposals for the revision of EU cabotage rules (Regulation (EC) No 1071/2009) and the rules on access to occupation (Regulation (EC) No 1072/2009). This comes in anticipation of the European Commission ‘road initiative’ planned for the 1st semester of 2017, which is expected to solve out critical market and social problems the sector has been confronted with in the past decade. This is the second set of concrete proposals published by the ETF in the past year, following its very successful publication in September 2015 of a five-action plan to improve enforcement in the road transport sector. The new proposals contain tangible measures to eradicate letter-box companies, to clarify the definition of cabotage and to ensure that labour and social rights are respected. With minimum political will posting of workers and cabotage rules can be perfectly enforceable. The ETF contribution is prompted by numerous calls by the Transport Commissioner Violeta Bulc for concrete solutions to tackle social dumping and unfair competition in the EU haulage market. It equally follows a major study commissioned by DG MOVE, concluding that the two above regulations had failed to meet their policy objectives and recommending tighter measures, simpler rules, along with better means and support for cross-border enforcement. The European Commission is currently running a public consultation process covering about 10 EU directives and regulations applicable to road transport. It is not yet certain whether the ‘road initiative’ will contain legislative proposals or will simply consist of explanatory guidelines. The ETF Road Transport Section reiterated at its meeting on 7-8 September in Brussels the committed to actively and constructively participate in the consultation process. However, the Road initiative is seen as the only opportunity for substantial positive changes to the social situation in the sector. The Section thus decided to organise a major action in March – April 2017 in an attempt to make the EU institutions listen to the voice of those who spend days, weeks, often months behind the wheel in some of the poorest living and working conditions in the EU.